Nueva Tormenta Tropical por la zona de Fiji. Depresión Tropical para http://www.met.gov.fj/, situada al noroeste del pequeño archipiélago de Pago Pago, con previsión de ciclón en dos o tres días, a medida que se desplace dirección este-sureste. At 18:00 PM UTC, Tropical Depression 09F (999 hPa) located near 12.8S 175.6W has 10 minute sustained winds of 30 knots. The depression is reported as moving east at 13 knots. Position poor based on hourly GMS infrared imagery and peripheral surface reports. Organization has not changed much in past 24 hours. Convection has decreased significantly influenced by diurnal variation and increasing environmental shear. System lies south of an upper ridge in a moderate sheared environment. Outflow good to the east. Cyclonic circulation extends up to 500 HPA. Sea surface temperature is around 29C. Dvorak analysis based on 0.4 wrap in LOG10 spiral, yielding DT=2.5, MET=2.5, PT=2.0. Final Dvorak number based on DT. Global models have picked up the system and move it eastward with some intensification. 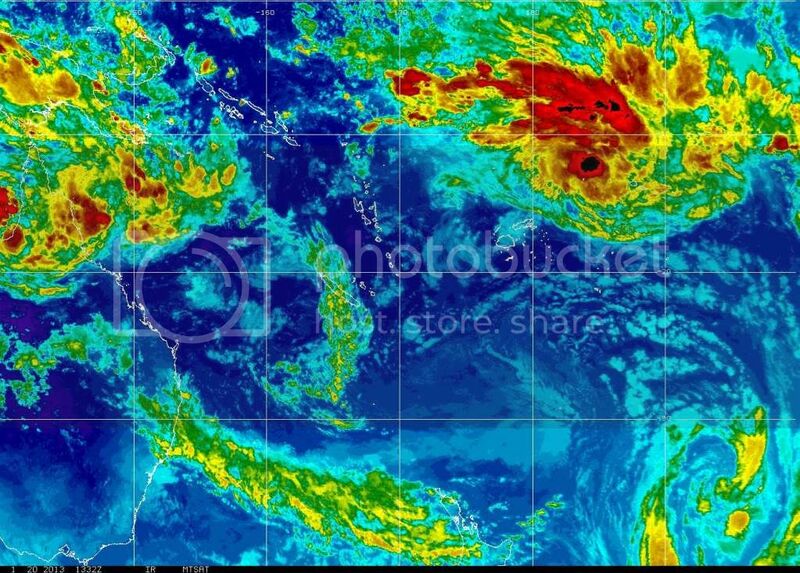 HURRICANE WARNING 077 ISSUED FROM RSMC NADI Jan 24/0810 UTC 2013 UTC. SOUTH 165.2 WEST AT 240600 UTC. REPEAT POSITION 14.0S 165.2W AT 240600 UTC. CYCLONE MOVING SOUTHEAST AT 10 KNOTS. AND NEAR 15.5S 162.7W AT 250600 UTC. THIS WARNING CANCELS AND REPLACES WARNING 076.